Multi-Currency support for eCommerce provides Google Analytics users with the ability to track transaction metrics (total revenue, tax, and shipping & handling) in multiple local currencies within a single web property. And Google Analytics will convert them into the one currency based on your profile setting. This provides key benefits for e-commerce brands looking to conduct analysis across an international customer base and helps make some previously complex reporting easier. Multi-currency is supported by web tracking and Android SDK (iOS SDK support is coming soon). The ‘currency code’ is a global setting that can be set via tracker ‘_set()’. 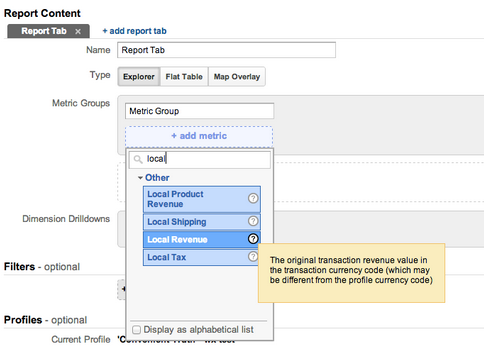 It only need to be set once, unless the page is sending multiple transactions in separate currencies. How the conversion rate is decided? The conversion rate is pulled from currency server which is serving Google Billing. The value is the daily exchange rate of the day before hit date. See a technical overview for additional information. Which currency does GA support? 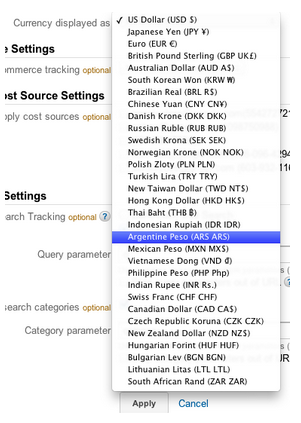 We support currencies which are available in GA profile currency dropdown menu. Right now, 31 currencies altogether are supported. Which currency code shall I use? A full version of currency codes shared across Google products is available on the Google Developers site. Can I retro-process my history transaction data? Only from the day you started using multi-currency support, you can get both local and global value. To get started today, view our help center page with detailed instructions on how to begin. We’ve listened to your feedback and have heard the requests loud and clear: E-Commerce should support multiple currencies. We’re pleased to announce the launch of this feature which will be rolling out to all users over the next few weeks.